Fill out this quick form to have a local slab leak repair specialist contact you! Slab leaks can become a major problem if not addressed correctly by a professional. Water pipes that leak below the slab of a house can be very frustrating to homeowners when it's hard to know exactly where the leak is or how big the problem is. 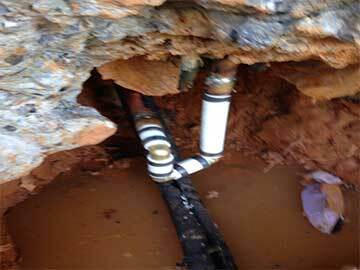 Very old pipes, damaged copper or defective polybutylene pipes, will eventually leak. Signs of a leak can show up in a variety of ways, like an extremely high water bill or warm or wet spots showing up though the concrete floor. So, you hire a professional plumber and they tell you there is a slab leak. Many homeowners have the same question when presented with this news. What is a slab leak? A slab leak is serious and it is in the best interest of the homeowner to find out exactly what is going on before it creates even more costly damage. To put it simply, a slab leak is water or fluid leaking through pipes installed in to or under the concrete slab. Since buildings are often constructed on these slabs, the plumbing for a home or a business go under the foundation. A slab leak may indicate that the foundation may have moved if it's cracked and outside water is leaking in or the pipes below the concrete broke. Slab leak that goes undetected, can further cause damage to the foundation or slab creating an air pocket and weaken the concrete further, pulling the pipes and potentially causing even more damage. Don't wait to find out what's going on below your home. A slab leak can often be detected before the damage becomes too costly. A homeowner should look out for certain cues and signs to see if a slab leak is happening. Is the well pump water running all the time or too often, even when no water is turned on? This could be the symptom of a broken pipe. Is there a hot spot on the ground floor that can't be explained? Escaped hot water could be heating that spot from below. If a homeowner has high water bills despite conserving water at every turn, this could be a symptom as well. Mysterious cracks in the walls, ceiling, or floor can also be damage from an undetected slab leak. 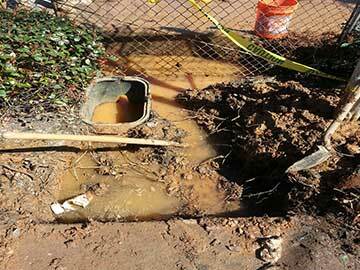 If there is suspicion of a slab leak, it is best to call a professional for water leak detection. Tearing in to the floor of the house or the concrete can leave a mess that will cost more money to fix. A professional plumber will bring in tools to discover if there is a slab leak or another issue. Just because there is a symptom of a slab leak, doesn't mean that is the ultimate issue. There are also may be ways to fix the leak without tearing up the foundation. This will save money in the end. The pipes that need to be replaced are often done through a process called repiping. Often old pipes are made of polybutylene, a type of material that has a reputation for having problem leaks. 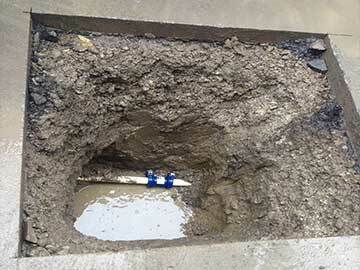 These pipes breaking are often the cause of slab leaks. The polybutylene pipe was considered the pipe of the future in the 1970's, but by the mid 1980's these pipes started to break down. These pipes were used until 1995, being installed in millions of homes around the country. They can often break down without warning, even if they have been quietly serving a home or business for years. What Pipe Alternatives Are Out There? The two major alternatives to polybutylene are Polyvinyl chloride (PVC) pipes and copper pipes. PVC is a cheap and hard plastic that has proven to stand up to high pressure and long life. It is resistant to corrosion and abrasion. However, PVC pipes can grow bacteria and is much more delicate to install. Copper, on the other hand, is durable during installation and has a long life. Many prefer the taste of water ran through copper pipes than the plastic taste of PVC. Copper is also very flexible, earthquake resistant, fire resistant, and can fit in to tighter areas. The downside of copper piping is that people often complain of a metallic taste, can be corroded with acidic fluids, and is labor intensive to install. Both types of pipes are much better than keeping polybutylene pipes in place. Get professional help with increasing your online presence and getting targeted, high-quality Plumber Leads.